No part of our history is untouched by the one-time American enslavement of African peoples. That thought flashed into my mind as I began to read “American Eclipse” by David Baron. From my summer book stack I picked up American Eclipse to break away (for a little while) from my summer reading of fiction. 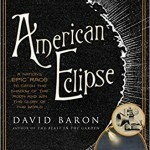 American Eclipse is a non-fiction book about early American astronomers and their attempt to observe and measure the effects of the total eclipse of the sun in 1898. Within two pages of reading, in setting the context for the lives of astronomers at that time, the author talks about the civil war ending and that end motivating scientists to get to work. Nothing in the psychology of American enterprise is uninfluenced by the one-time enslavement of African peoples, was the second flash of thought I had. No part of our history is untouched by the unfair, genocidal treatment of American Indians. Yep, that flashed through my mind as I read. Another flash: Nothing in the psychology of the American enterprise is uninfluenced by the too long resistance to acknowledging the powerful intellect of women. 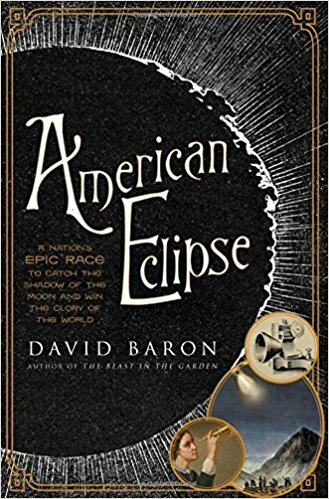 If you are at all interested in early American scientific endeavors of astronomy (and a bit about early meteorology), “American Eclipse,” is a fun, five-star read. Stories of the real lives and motivations of a bunch of eclipse obsessed scientists; their technological challenges and human adventures leading up to their chance to observe the 1898 total eclipse that could be observed from America. You see, “American eclipse” is not about any of my flashes; not the enslavement of Africans, not the stealing of land and life from American Indians, not demeaning views of women. But those are part of the context of America even in a book about early American astronomy. In American Eclipse, there are statements people made in 1898 that are the same statements people make today about blacks, American Indians and women. That is why it is more than fair to say that nothing in the psychology of our 21st century is uninfluenced by our histories of intergroup bigotries. Yet, know this too: Nothing in our American psychology has been so profound, and important, as discounted peoples pushing through, and defeating, America’s too many intergroup bigotries.